When your garage is due for an upgrade, look no further than Custom Garage Works! 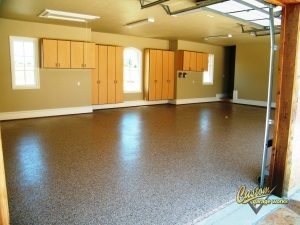 Back in 2003, we began by offering top quality garage floor coating in Ennis,TX. After searching high and low in the existing industry, we were surprised to find very few options that were up to a top quality standard, so we got into the industry ourselves, to turn things around. Now, we offer some of the greatest garage storage cabinets in the industry, as well as high quality polyurea polyaspartic floor coatings that last years longer than traditional epoxy floor coating. We are committed to excellence, and we are passionate about providing premium garage floor coating and custom garage organization throughout the DFW area. 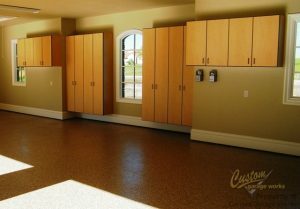 Out of all of our services, our most popular services is the polyurea polyaspartic floor coating in Ennis, TX. This is because by using polyaspartic coatings instead of epoxy, we create a finish that lasts longer and is more durable. Thanks to the tough composition, our polyurea-based floor coating is resistant to changing color and flaking that can occur with epoxy. And due to our use of a diamond grinder instead of risky acid etching for floor preparation, we can ensure a greater amount of adhesion, which leads to a quality installation. Give us a ring at 214-494-9068 or 817-308-1305 for your free estimate now, and we can tell you more about our premium garage floor coating service. And More! If you are interested in other garage floor choices, check here to see our other services! When you choose a storage solution from Custom Garage Works, you never have to wade through mountains of clutter in your garage again. Your garage looks best when it is tidy and organized. We have many solutions to your garage organization issue, including garage cabinets and overhead storage racks. All of our Bulldog cabinets are secured to the wall for added safety, and our overhead storage racks are stronger and more reliable than the others you will find on the market. If you need a resilient garage floor coating in Ennis, TX, and unbeatable organization solutions, you can count on Custom Garage Works. Overhead Storage Racks If you want to get the most out of your overhead storage space, our reliable storage racks are a great place to start! Storage Cabinets Unlike traditional cabinets, ours are designed specifically to let you get more from your garage space! Car Lifts Our car lifts let you keep your cars with style and accessibility, and they will not scar your garage floors! And More! We offer a extensive variety of garage organization resolutions to our clients, to provide the optimal custom garage!